CLEVELAND INDIANS’ OUTFIELDER Austin Jackson pulled off a pretty spectacular catch last night. It was that good, it brought Boston Red Sox fans to their feet for a standing ovation at Fenway Park. 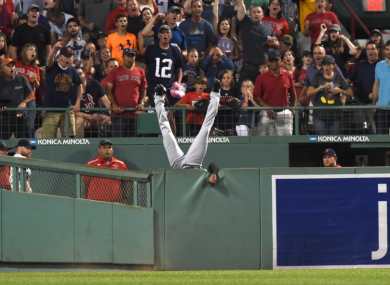 He made the catch in the bottom of the fifth inning, somehow keeping the ball as he flipped over the wall and robbed the Red Sox and Hanley Ramirez of a home run. “With that particular one, you got back and tried to get to the fence first and when I jumped and caught it I realized I was about to take a tumble on the other side and luckily I was able to grab the fence a little bit and flipped over,” the man of the moment said after the game. “That was one of the best catches I think I’ve ever seen,” Indians manager Terry Francona added. Jackson’s side lost 12-10 in the end, but his catch will surely go down as catch of the season. Email “Catch of the year? This Cleveland star stunned everyone at Fenway Park last night”. Feedback on “Catch of the year? This Cleveland star stunned everyone at Fenway Park last night”.